There were a lot of trailers on display at the Overland Expo just outside Flagstaff this year. 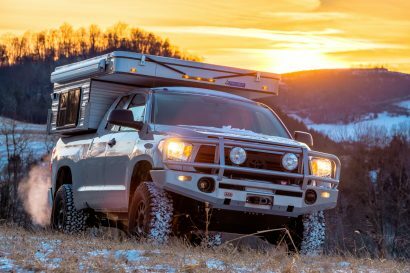 Most of them were instantly recognizable as “Overlanding” trailers by the amount of farkle on, in and around them. Fridges, stoves, shovels, awnings, tents, drawers, sinks, lights… they had it all. But one little trailer stood out from the herd. 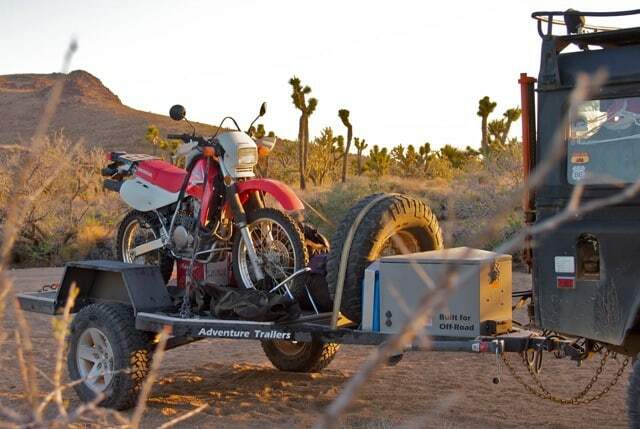 It stood quietly in front of the AT Overland booth like a new-born colt, naked save for a battery box on the front, and a mid-size dual-sport motorbike perched on its back. And like a colt, its lines showed off its heritage. 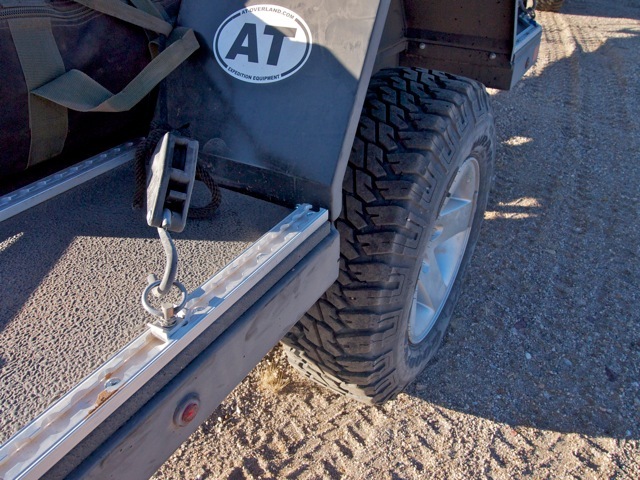 Underneath is a 2″ x 3″ fully-boxed, 1/8″-wall, steel frame, the patented “TASS” Airbag suspension, with Rancho Shocks, fully adjustable toe and camber, 1750 lb independent spindles, and a fully articulating hitch. On top there is a Fiberthane composite deck, coated with a flexible yet durable spray-on p-tex urethane coating, and a full perimeter tie-down system with aircraft aluminum track. Not content to just look at the sleek little trailer, we decided to take it on a run through the desert in the week immediately after Expo and see how it handled. 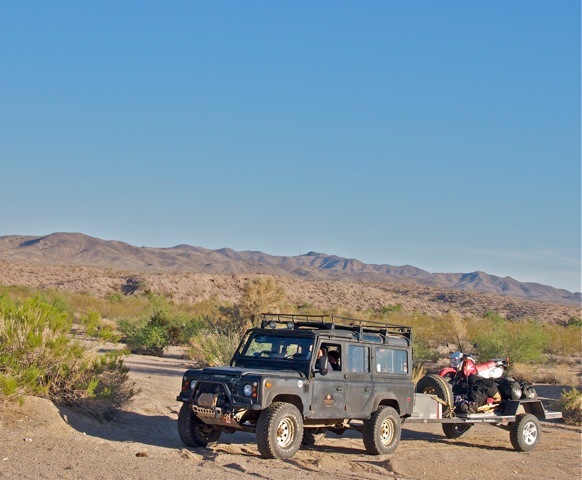 So, loaded up with a Honda 650XL, an Oz-tent, and enough food, fuel, camping gear, and water for 9 people to spend 4 days in the desert, we set out on the Mojave Road. My easiest point of reference is a trailer I have been using for years to transport motorbikes. It has a torsion-bar suspension, with no shocks. I have gotten used to looking in my rear-view mirror and seeing my bikes bouncing along behind me. When I was towing the AT Flatbed, the first time I looked in the rear-view mirror my brain initially couldn’t compute what my eyes were seeing. I almost stopped the truck because it seemed so odd. Even though we were going along a bumpy little track, with continuous rocks and dips, the bike was not bouncing wildly along behind us. In fact, the bike was not bouncing AT ALL. It was sitting rock-steady behind the Defender. Once I realized that the independent air-bag/rancho-shock suspension in the trailer was responsible for my state of suspended disbelief, I decided to see just how good it was. This entailed hitting slightly bigger bumps and dips, progressively faster, to see if I could make the trailer bounce. Our 110 is running 315/75R16 wheels with a 3″ lift on progressive springs, so it can take a lot of bumps, but after I bounced my wife off the roll-bar the second time, still without bouncing the bike at all, I was forced to admit that the suspension in the Flatbed really is that good. The other interesting part was the hitch. In the past I have primarily used two types of hitch: a ball, which is convenient and quiet, but does not permit extreme articulation, or a pintle-hitch, which allows extreme articulation, but is anything but quiet. Although I have been aware of other hitch options for a few years, and have used one or two (primarily on the pavement), this was my first experience using what AT calls the “Multi Axis Max Coupler” hitch on a proper trail. Unlike a pintle, the Max coupler slots into your standard receiver. The articulation is great, there were a few spots where the truck was leaning left, the trailer was leaning right, and we were climbing in or out of a wash, all at the same time, with no issues at all. The hitch is also very quiet, because at the centre of the hitch there is a nylon bushing. The other nice thing was being able to adjust the suspension as we added and removed weight. 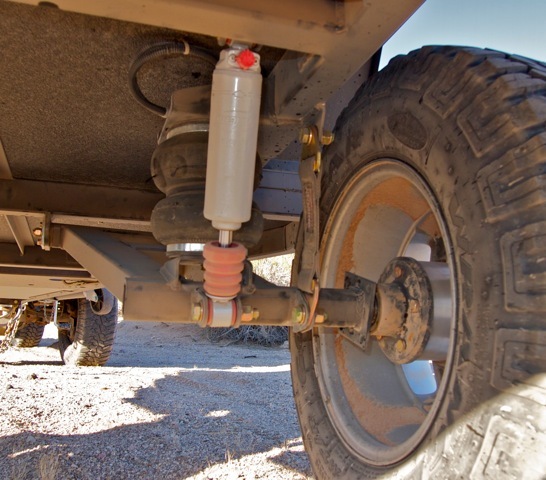 The two airbags each have a standard air fitting on the front of the trailer, allowing you to adjust the ride height as you add gear or use it up during your trip. Overall, I was very impressed with the new AT Flat Bed. 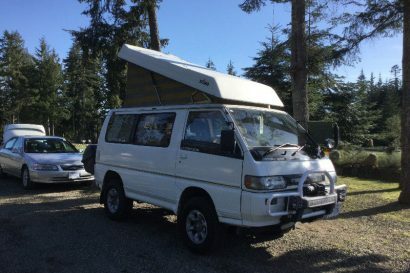 It works well, it’s practical, and it looks good. 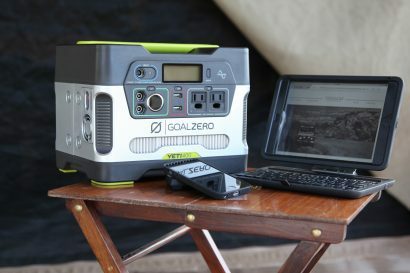 I think if I bought one I would have a few removable water and dust-proof boxes mounted so that I could securely carry some additional gear on dedicated camping trips, but still be able to use the full open trailer for things like carrying bikes, lumber, machinery, etc.